Using consumer products for purposes other than their intended function is usually just inconvenient — have you ever tried eating soup with a fork? It’s the worst! — but when you get weapons and the Transportation Security Administration involved, it’ll likely lead to some hefty consequences. Case in point: a knife hidden in a shoe. 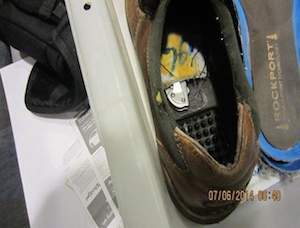 A traveler going through security at the Detroit Metropolitan Airport has been arrested, TSA authorities say, after he was allegedly found with a knife stuck inside the bottom lining of one of his shoes. Which, besides being illegal, sounds darned uncomfortable. Officials say airport police responded and arrested the man, which is about all the detail the Associated Press is reporting. At one point the TSA had decided to allow small knives on planes, but that decision was eventually reversed last summer after industry groups representing flight attendants and others complained that it would pose a security risk to allow such weapons on board. Next Am I Completely Screwed If My Student Loan Co-Signer Dies? Next Up: Am I Completely Screwed If My Student Loan Co-Signer Dies?